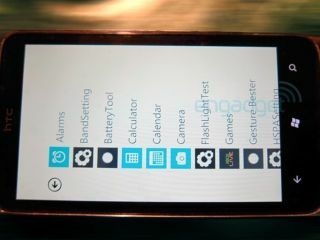 AN HTC phone running Windows Phone 7 has been spotted, with the smartphone bringing a 3.7-inch SLCD display and a 1GHz snapdragon processor. Windows Phone 7 is important for Microsoft, and HTC has been a key supporter of the company's mobile OS in the past, so it is no surprise at all that a handset is being readied. The phone has the requisite three hard keys for Windows Phone 7, with the specs very similar to the Android-toting HTC Desire. One thing to note is the UI does not bring the well-received HTC Sense UI, which many felt put the Desire above the Google Nexus One. According to Engadget's tipster, the phone also carries an 8MP camera and is all ready to go. Just add the final version of Windows Phone 7.